I got Sense and Sensibility and Sea Monsters mainly because it looked just the right amount of silly. With a title like that, it couldn't be anything else, right? The story follows the Dashwood family, comprised of three sisters named Elinor, Marianne and Margaret, and their widowed mother, as they attempt to make their way in a world where an alteration in the world has caused aquatic creatures to become actively aggressive against humanity. After their father is eaten by a hammerhead shark and evicted from their childhood home, the Dashwoods find a new home on Pestilent Isle where they meet both new friends and strange eldritch creatures. While Elinor must face the prospect of being parted from her beloved, Marianne finds herself courted by both the dashing treasure hunter Willoughby and the wise if tentacle-faced Colonel Brandon. Meanwhile, Margaret finds herself drawn into the mysterious goings-on around the island. 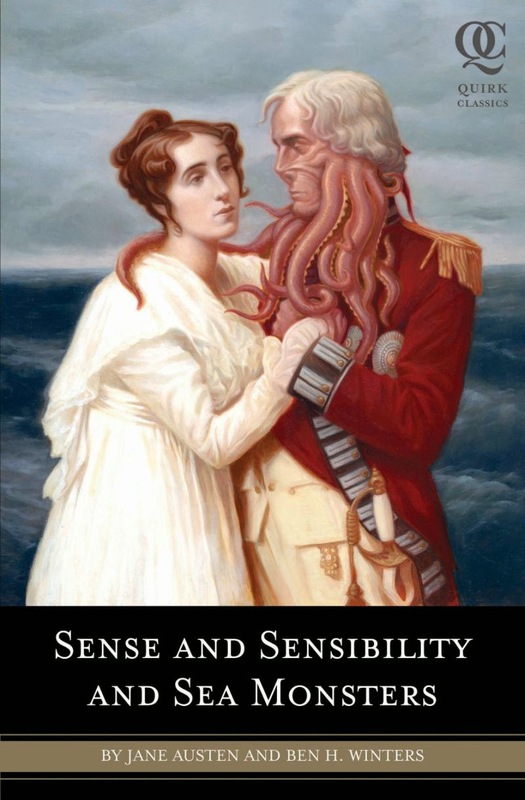 As you can probably guess from my summary, Sense and Sensibility and Sea Monsters is a very silly combination of Jane Austen's Sense and Sensibility and something very reminiscent of the Cthulhu mythos. It was about as ridiculous as I had initially expected it to be, but also surprisingly cutting and in some ways a lot smarter than I had given it credit for. Still thoroughly stupid though, so if you're in the mood for something a little bit surreal and deliberately uneven in tone then this is definitely going to whet your appetite. I don't know quite how this would read to huge fans of Austen's work, but it didn't have a particularly reverent feel to it. It's odd, but this is quite a difficult book to review. Sense and Sensibility and Sea Monsters does exactly what it says on the blurb, and if that concept sounds great to you then you will most probably enjoy the book itself. Personally, I loved it, but I feel like this is very much a love it or hate it sort of book.